Costco (NASDAQ: COST) is scheduled to announce its fiscal first quarter results on Thursday, December 13. Costco’s revenue increased 5% year-over-year (y-o-y) to around $44.4 billion in the fourth quarter, driven by growth in membership fees and a 10% increase in comparable sales. The retailer reported net earnings of $2.36 per share, up 13% y-o-y. However, the stock traded down, as gross margins narrowed despite higher sales and the company disclosed a material weakness in its internal controls. The gross margin compression was largely due to the company’s investments to boost online sales through services like same-day delivery and automated fulfillment centers. In addition, a higher percentage of total sales also came from gasoline, which is generally less lucrative for the company compared with the merchandise in its stores. Our $236 price estimate for Costco’s stock is slightly ahead of the current market price. 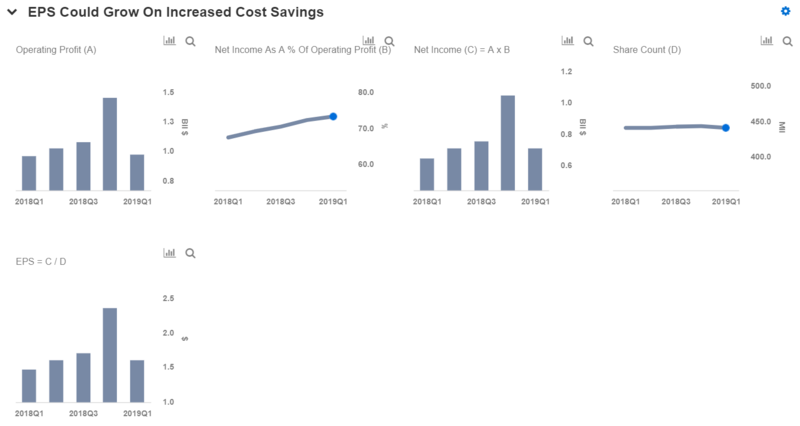 We have created an interactive dashboard that provides an overview of Costco’s Q1 expectations, which outlines our forecasts for the company’s next quarter. You can change expected revenue, operating margin and net margin figures for Costco to gauge how changes would impact expected EPS for the fiscal first quarter. We expect Costco’s revenue and earnings to grow in Q1, primarily due to the company’s value offerings and high membership renewal rates, coupled with cost and productivity savings. In a recent report, Costco reported that its comparable store sales increased 9% during the fiscal first quarter, including the impact of gasoline prices and currency effects, largely driven by an 11% comparable sales growth in the U.S. and 2% in Canada. Excluding gasoline and currency fluctuations, combined comparable sales increased by 8%, driven by 8% growth in the U.S. and a 6% rise in Canada and other international markets. The retailer also reported net sales of $34.3 billion, an increase of 10% from $31.1 billion during the same period last year. That said, the company’s continued growth momentum confirms that it should be able to continue to see healthy traffic at its brick-and-mortar warehouses despite stiff competition in the grocery sector in the long run. Costco’s membership revenue grew 10% y-o-y to $3.1 billion in fiscal 2018, due to new sign-ups and increased penetration of the company’s higher-fee Executive Membership program. Currently, Costco’s member renewal rates are 90% in the U.S. and Canada and 88% worldwide. Going forward, we expect the company to report around $750 million in membership fees in Q1, up nearly 8% y-o-y.